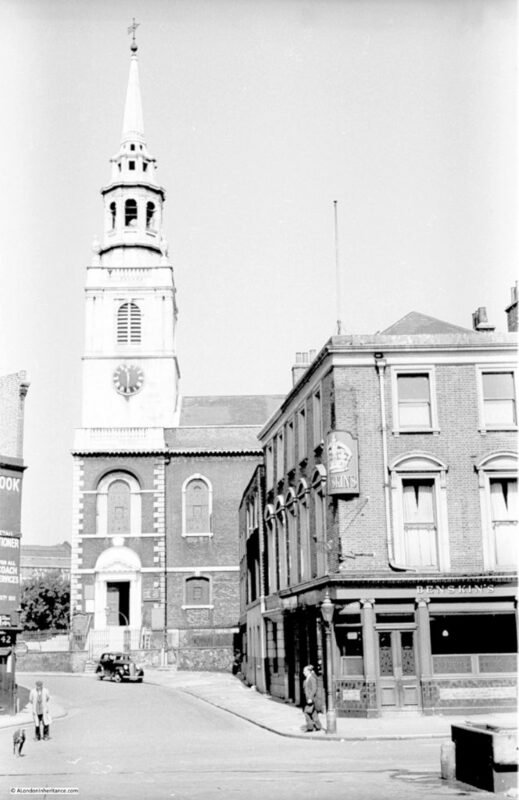 It is 11:30 on a sunny Sunday morning, the 6th September 1953 and my father is in Clerkenwell Green and took the following photo looking down Clerkenwell Close towards the church of St James Clerkenwell. One of the doors to the church is open, perhaps there is, or has been a Sunday service. I doubt the man walking his dog would have attended, he was probably more interested in when the pub on the corner would open. And this is the same view in the summer of 2017 (although a week day rather than a quiet Sunday morning). 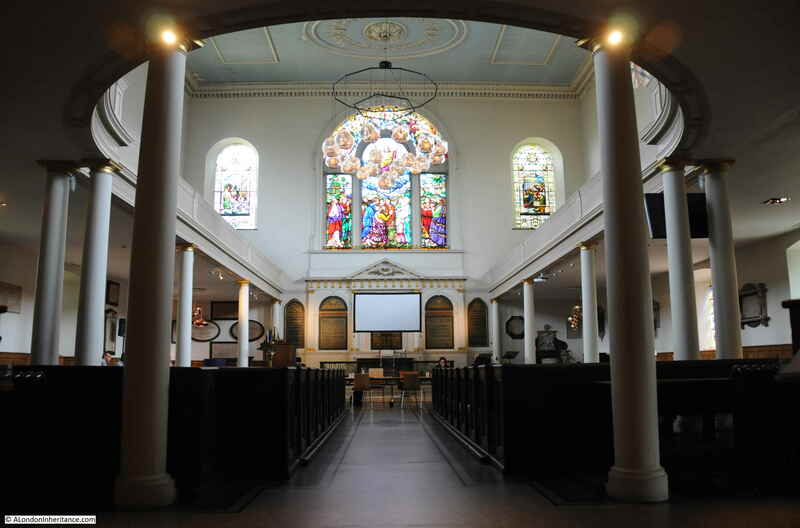 The church of St James Clerkenwell we see today was built between 1788 and 1792. It replaced a much earlier church, parts of which dated back to the twelfth century. Prior to the reformation there was an Augustinian nunnery dedicated to St Mary on the site, and after the reformation parts of the building were used by the parish as the parish church. 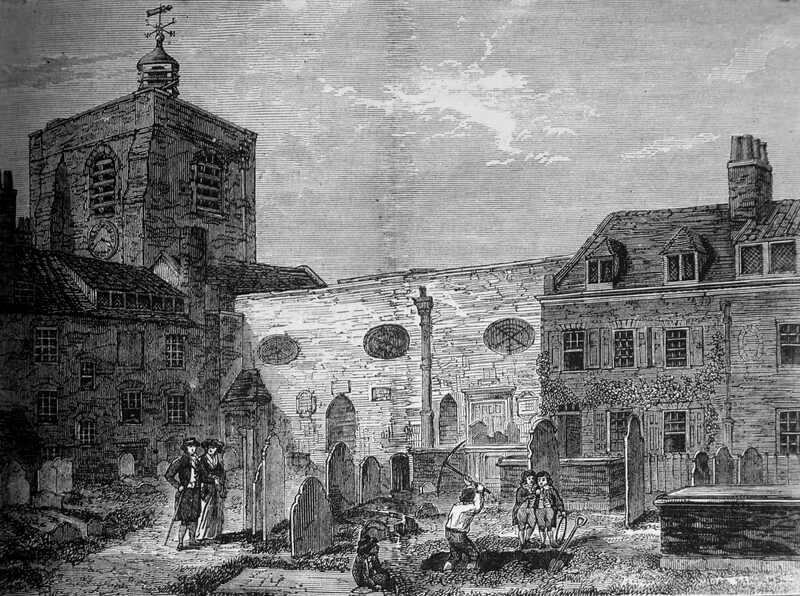 The following print from Old and New London shows the old church of St. James. 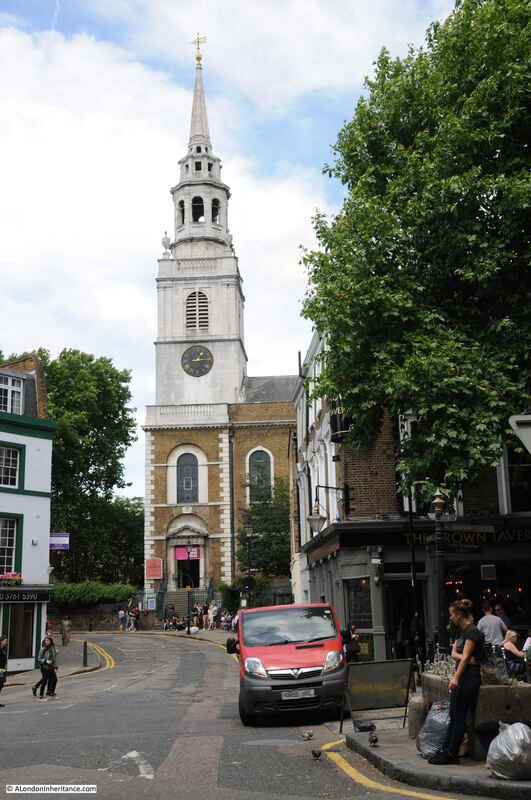 The old church originally had a steeple but appears to have suffered a common problem of London’s churches, due to their age and poor maintenance of the fabric, as the steeple collapsed in 1623 and there was a later second collapse due to poor construction of the replacement. Repair work was carried out and the church was left with the squat tower shown in the above print rather than a steeple. I am always fascinated by the growth of London and how parts of the city were once on the boundary. 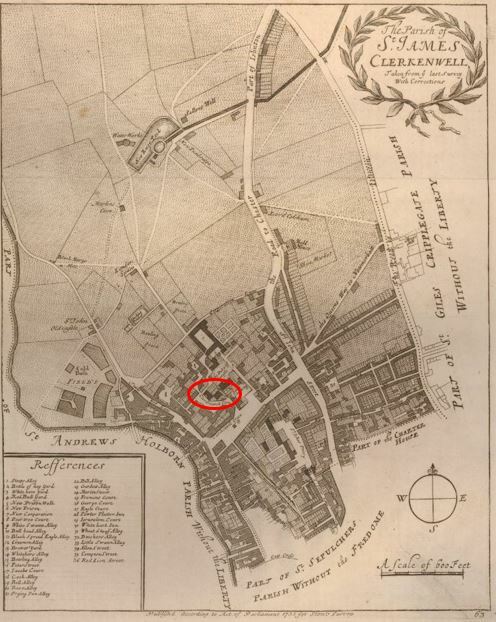 The following map produced in 1720 for Stowe’s Survey of London shows the parish of St James Clerkenwell. The red ring marks the location of what at this time would have been the original church and not much further north were open fields. The street in the centre running from top to bottom of the map is St. John Street which retains the same name today. In 1720 St. John Street was labelled as “the road to Chester” which is an interestingly distant location to mark on a parish map. The new church was designed by the architect James Carr. It cost nearly £12,000 and was consecrated by Bishop Porteus in 1792. 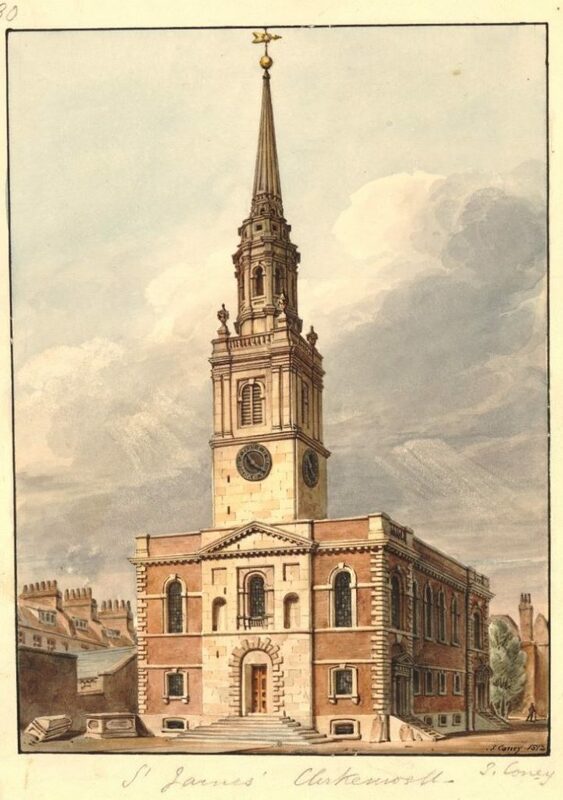 St James Clerkenwell in 1812, twenty years after completion (©Trustees of the British Museum) . In my father’s 1953 photo there is a pub on the corner of Clerkenwell Green and Close and the pub is still there today and does very well on a summer’s day. This is the Crown Tavern and occupies the corner plot, but if you look at the above photo, the houses on the right and left of the pub are of exactly the same style and construction – these buildings were originally part of the pub and although internally they have been subject to major reconstruction, externally they maintain the link. These building are of mid 19th century construction with some reconstruction in the late 1890s. 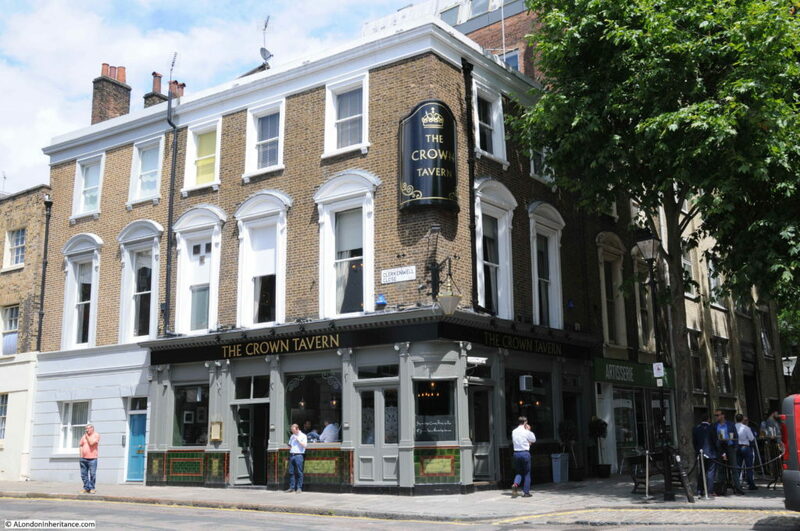 The Crown Tavern is allegedly where Lenin and Stalin first met in 1905. 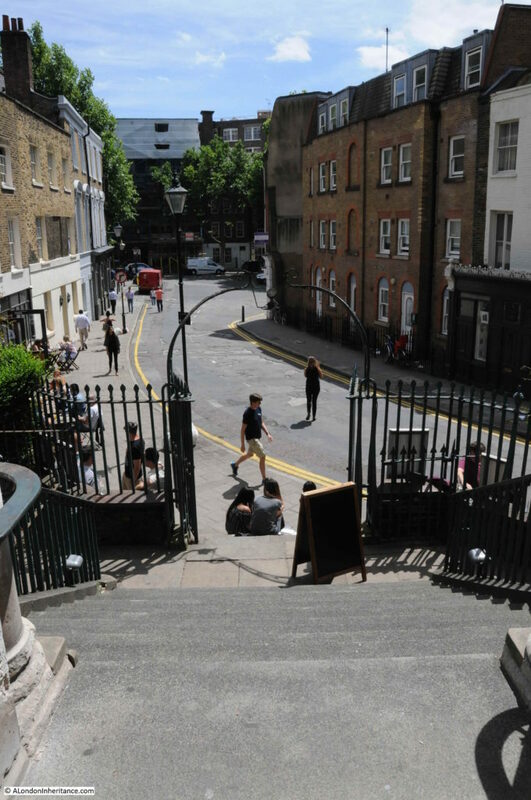 Although the front of the church and main entrance is on the end of the church where Clerkenwell Close bends around the church, the entrance today is the side entrance looking back towards Clerkenwell Green. A flight of steps lead up to the church entrance, which as can be seen in the photo below, is well above street level. The interior of the church was subject to Victorian “restoration” so is very different to the original interior. Today the church appears to rent out work space so I thought it best to avoid walking round the church taking photos and disturb those working. This is the view from the entrance. There is still a large churchyard surrounding the church, although any original gravestones are long gone. 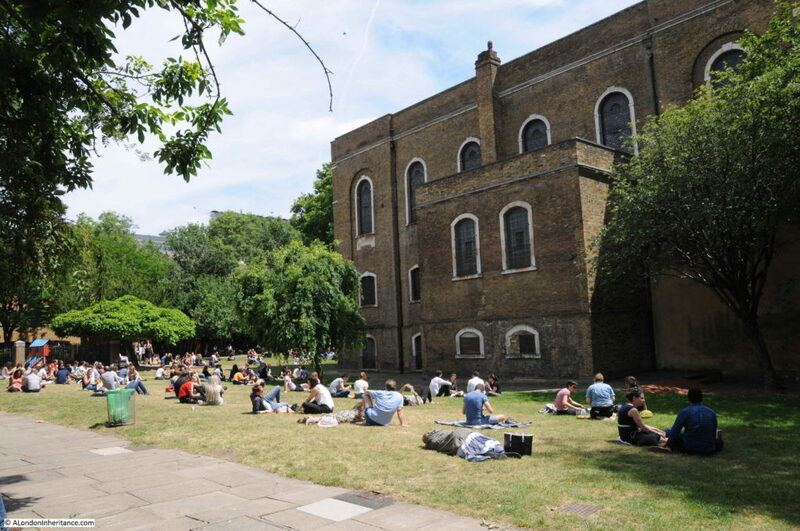 On a summer day, the churchyard is now a major lunchtime attraction for local workers. 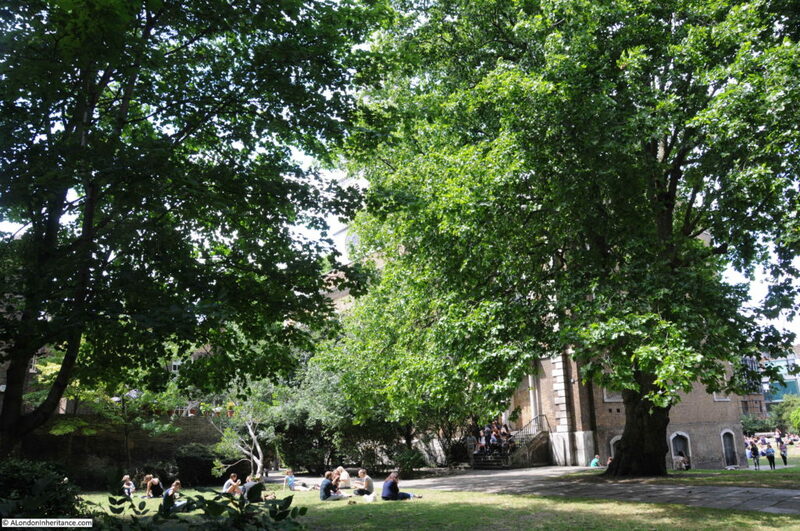 The church is surrounded by a number of mature trees which help to distance the churchyard from the surrounding busy streets. 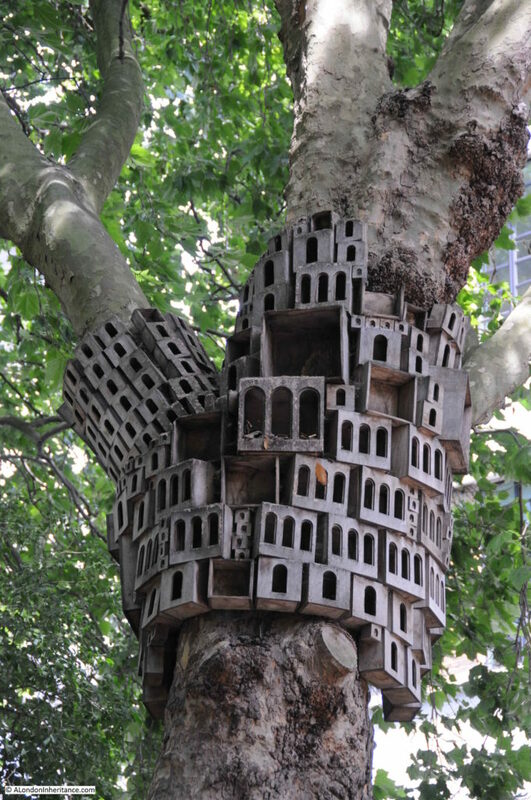 One of the trees has a sculptural installation of bird boxes by London Fieldworks and dating from 2011. Before leaving St. James, it is good to see that the tower and steeple still rise above the surrounding buildings. Too many central London churches are now in the shade of their surroundings. 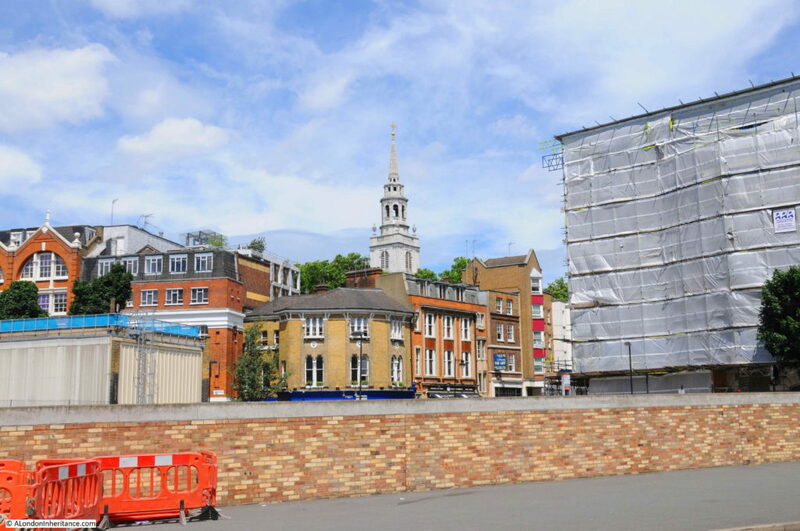 This is the view of the church from Clerkenwell Road. 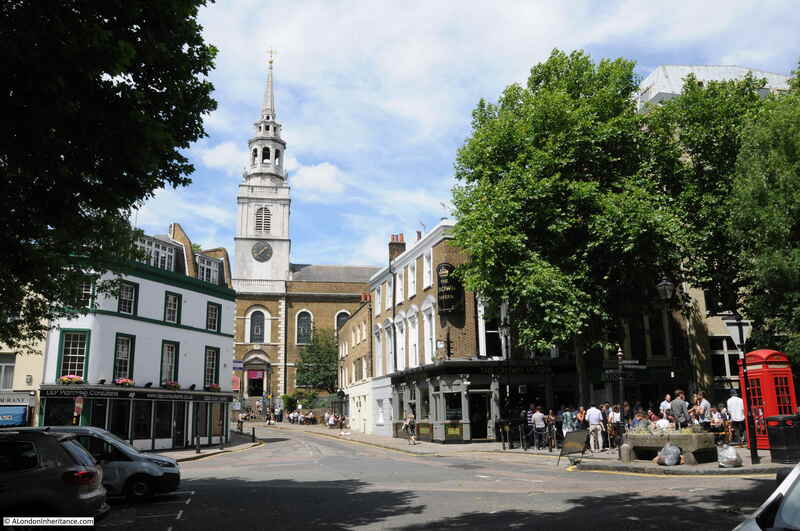 St James Clerkenwell and the area around Clerkenwell Green deserves a much longer write up, however I have had too many other commitments this past week so I shall have to return in the future – perhaps on a Sunday morning at 11:30. This entry was posted in London Churches and tagged Clerkenwell, Clerkenwell Green, St James Clerkenwell on August 20, 2017 by admin. How timely. I spent most of last weekend looking at this very area on google maps and comparing it with old photos of the area – it has a real village feel, despite most of it being built in the 17th and 18th century as a result of the earlier institutions. I like this part of London but am usually on my way to somewhere else and use it as a cut-through. I need to rectify this next time I am down in town. Collage has an excellent repository of photos of Clerkenwell, so if you fancy losing an entire afternoon, you know where to go. Looking forward to part two. Clerkenwell Green has a lot of history. Dickens set parts of Oliver Twist there. Also, there is a very nice little coffee stand in the church gardens! Nice post. Lovely area of London. My first job was with a stockbrokers in London Wall who then moved to Clerkenwell Green so I got to know it during lunchtime walks. It was then full of small specialist scientific instrument makers (early 1970s) for which the area was renowned. I also remember a bomb site car park near Farringdon Station – think it was a V2 site. wish I’d taken photos then.. Thanks for this. I have spent the last few days trawling through family related entries in the St James parish registers and then your post appeared. Wonderful serendipity! It looks like a really interesting area and I have put it on my list for the next visit to London from the Antipodes! My mother lived in block B Peabody Buildings Clerkenwell Close as a child in the 1910’s, 20’s and then married at St James Church in 1934. She spoke about her childhood playing in the close with friends. About the drying Rooms for clothes on the top floor. She attended Hugh Middleton School left at 14 and got a job at Murrys Chocolate Factory, which by the way she spoke she enjoyed.. I have yet to find out where this factory was. Any info would be appreciated. Thanks for the feedback Brenda – The R S Murray & Co chocolate factory was at 67 Turnmill Street. It was first built in 1882 to manufacture caramel and turned to chocolate manufacture in 1911. It was quite a substantial operation, employing up to 2,000 people by the start of the first world war.